Margo Channing. Legend. True star of the theatre. The spotlight is hers, always has been. But now there’s Eve. Her biggest fan. Young, beautiful Eve. But you know all about Eve…don’t you…? 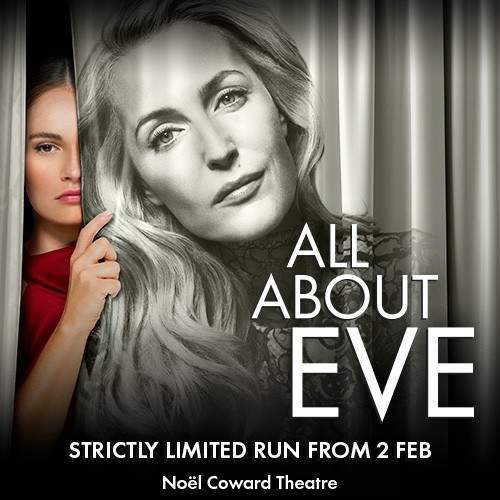 Ivo van Hove directs Gillian Anderson and Lily James in his new adaptation of All About Eve, a razor-sharp, unsettling exposé of the eternal obsession at the heart of show-business. BAFTA Award-winner Monica Dolan will join the cast in the role of Karen, alongside Julian Ovenden as Bill, Sheila Reid as Birdie and Rhashan Stone as Lloyd.